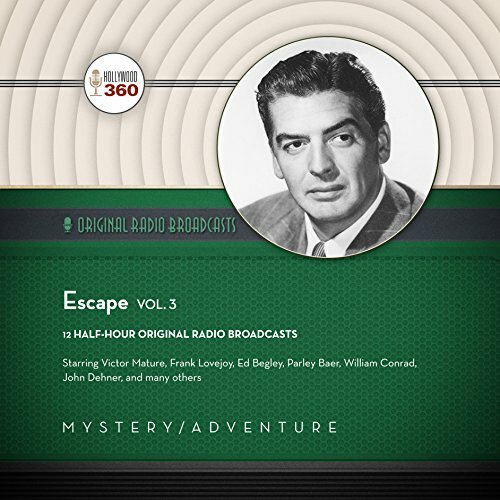 Escape was radio's leading anthology series of high-adventure, airing on CBS radio from 1947 to 1954. The series' well-remembered opening combined Mussorgsky's Night on Bald Mountain with an introduction spoken by Paul Frees and William Conrad: "Tired of the everyday grind? Ever dream of a life of romantic adventure? Want to get away from it all? We offer you...Escape!" Following the opening theme, a second announcer, usually Roy Rowan, would add, "Escape - designed to free you from the four walls of today for a half-hour of high adventure!" Many story premises, both originals and adaptations, involved a protagonist in dire life-or-death straits. Actors starring in the series include Victor Mature, Frank Lovejoy, Ed Begley, Parley Baer, William Conrad, Jack Webb, John Dehner, and many others. Music was supplied by Del Castillo, organist Ivan Ditmars, Cy Feuer, Wilbur Hatch, and Leith Stevens. Included in this collection are the following episodes: "Finger of Doom" (19 Mar 1949), "Confidential Agent" (2 Apr 1949), "When the Man Comes, Follow Him" (9 Apr 1949), "The General Died at Dawn" (16 Apr 1949), "The Great Impersonation" (23 Apr 1949), "Action" (21 Jul 1949), "The Fortune of Vargas" (21 Sep 1949), "Figure a Dame" (20 Dec 1949), "Seeds of Greed" (27 Dec 1949), "The Vanishing Lady" (10 Jan 1950), "Treasure, Inc." (24 Jan 1950), and "Two If by Sea" (14 Feb 1950).